Yesterday was quite the day. It was my thirty third birthday (is it odd that all day long I kept thinking, this is how old Jesus was when he died?). Sadie insisted on making cupcakes all by herself and they were spectacular. 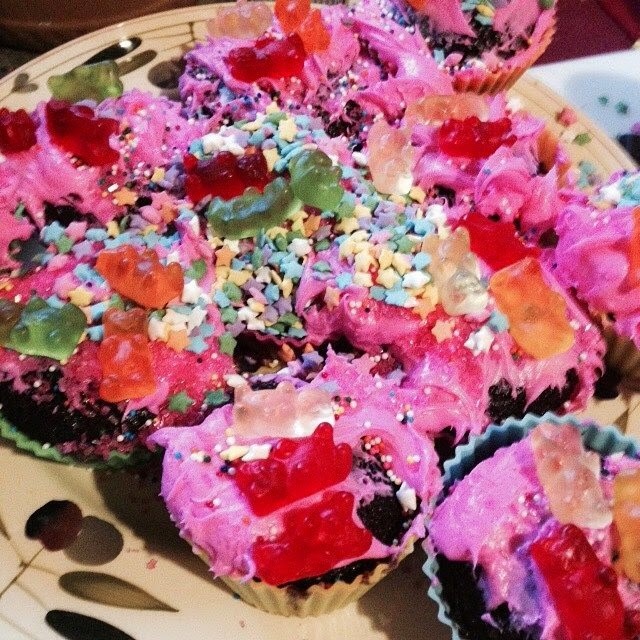 They were an extravaganza of pink and sprinkles. And sugar. Lots and lots of sugar. The low sodium diet is trucking right along. It's not as difficult as I thought it would be. Although I was horrified to learn that 2000 mg is roughly 1 tsp. Horrified. That's like no salt at all, I found myself thinking. I think, that before all this, because of whatever is going on with my sense of taste I was rather heavy handed with salt in my own cooking. Because the whole "this doesn't taste like anything unless I put salt and tons of red pepper on it" thing that's been going on. Now I'm being rather heavy handed with garlic and lime. The very best news of the day came in the morning when I got a phone call from the universities neurology department. The receptionist at the ENT place had told me they probably wouldn't call for weeks. So when I picked up the phone and heard who it was I was pleased. And when the receptionist told me that what usually happens with new patients is they get placed on a waiting list for at least a month before they're even scheduled, but I happen to have an appointment on Friday afternoon if you want it, I just about jumped for joy. And Paul gets off work really early on Friday's, so the timing couldn't be more perfect. In other related news I discovered that spinning around equals the most horrible headache of all time now. Maggie asked me to pick her up and spin her around (because vestibular dysfunction abounds in this house). I did. Instant headache that turned into a migraine with an aura. Thankfully, before going to that filling that broke a couple of weeks ago fixed (because April 1st was the only day in 2 months the dentist had to get me in) I discovered that Benadryl more or less destroyed the headache in about an hours time. Because the idea of having two fillings done with a migraine and lights flashing in front of my eyes on my birthday was kind of depressing. And to make this blog post somewhat less medical/boring for anyone who's made it down this far I have a Maggie story. Maggie has started calling James "Mermaid Baby." Yesterday she took a break from therapy to run over to where James was sitting on my lap, holding a mermaid tail. I thought she wanted help getting into it until I realized that she was trying to put James' legs in it. She insisted we put his arms through the arm holes and then she kissed him a few dozen times. Now to get ready for the last days of first grade with Sadie! They're open on Good Friday? I thought everything closed up then. Maybe regionally? I've never lived anyplace where anything was closed on Good Friday. Happy Birthday Cammie! Praying that this year brings good health! Happy Birthday! I hope this year is wonderful for you, full of joy. BTW, I use lots of onion powder as a substitute for salt in foods. I think it works very well and not having the salt in there doesn't seem so noticeable. But not everyone in the family likes it, so you'll have to try it out first. Onion powder, not onion salt.